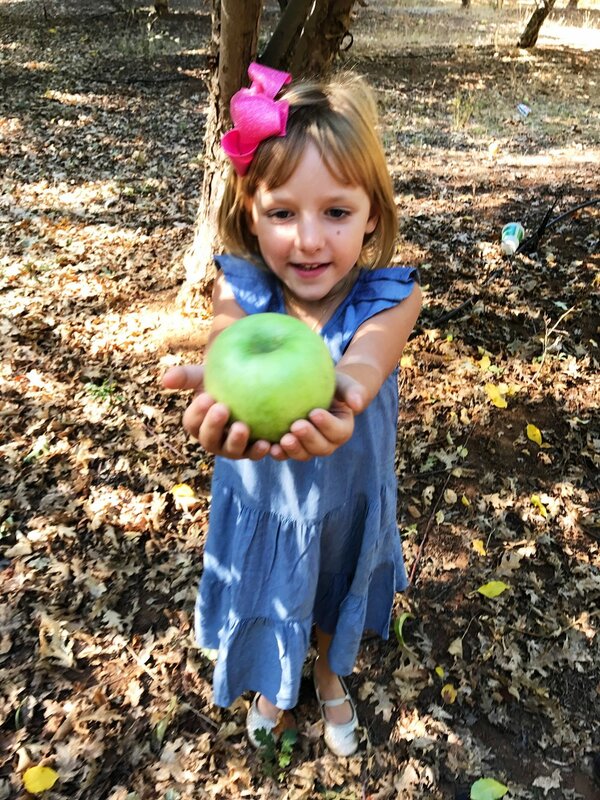 Every October, for the past 3 years, my family visits Apple Hill, a small community in the hills of Placerville, off highway 50, 59 miles east of downtown Sacramento, comprised of 55 fruit ranchers, Christmas tree growers, wineries and spas. You can visit year round, each time experiencing something new with each season. It has become our annual tradition to visit each Fall. The season starts on Labor Day weekend and runs through Thanksgiving. It is easy to spend an entire day visiting different orchards, filling up on sweets, cider, and loads of Fall fun. I suggest getting an early start as it can get very crowded driving through the windy roads between each location. Our first stop is always High Hill. It has become our habit to take a picture infront of the apple crates stacked in the parking lot before venturing into the ranch to enjoy a cup of coffee, apple fritters, and donuts. We wait patiently all year for these delicious fritters- perfectly crisp on the outside while gooey and sweet on the inside. Once we enjoy the treats, Fall can officially begin. High Hill is home to hay rides, a trout fishing pond, face painting, & craft booths. Last year we paid a visit to Delfino Farms, one of the oldest ranches in the area, it was established in 1964. At the entrance we were greeted with a craft station for kids housed in a cute shed labeled Kids Inc. The property is also home to a corn maze, heirloom pumpkins in the field available for picking, and a corn maze that is perfect for my little ones. There is a vineyard on the property. I read that they are hoping to expand their offerings by producing wine. I would suggest packing a picnic to enjoy while sitting on the large lawn overlooking the prestine property as it is very picturesque. Before leaving make sure to pick up a homemade pie to bring home to savior the sweetness of your trip. We also like to visit Abel's Acres for amazing caramel apples, lunch food options, and pony rides but there is no shortage of fun activities for kiddos to enjoy. If you are looking for good activities for kids here is a list of places to check out. Our favorite part of the trip this year was visiting a family friend's 10 acre ranch to pick up apples and tomatoes as well as visiting and feeding the goats on the property. Caroline could not contain her excitement. She was in her element, in her dad's arms, picking beautifully ripe, Golden Delcious apples and snacking on a few along the way. I must say, the apples were perfectly sweet and juicy unlike the few apples that our backyard apple tree yeilds every year. There is also a small organic farm also on the property, vegetables and herbs are growing in perfect rows overlooking the small valley. It was peaceful and romantic to spend the afternoon picking a few fresh goodies. This was the last stop on our tour. With a car full of apples, pumpkins, and tomatoes we headed home to cook with our fresh pickings. This year we made apple pies IN the apples. I also thought it would be fun to serve apple cider INSIDE a carved out apple as well. The picture does not do the drink justice but it is a fun, festive way to serve a beverage at your next gathering. 1. Slice of top of apple and hallow out the inside making sure to scoop out all seeds and not pierce the flesh. 2. Fill with apple Pie filling. 3. Roll out pie crust and cut into 1/2 inch slices. Lay 1 row of crust along the top of the apple. To make the lattice, lift alternating slices and lay down an intersecting strip. Flip slices down and lift up the opposite alternating slices, laying down another intersecting strip. Repeat this until the top is covered. 4. Place apple in baking dish & cover the bottom with water. Cover with tin foil and bake for 20 minutes. Remove the tin foil & bake another 20minutes to allow the crust to brown. Let cool for a few minutes & enjoy with a scoop of Vanilla Ice Cream. Slice off top of apple and hallow out inside making sure not to pierce the skin. Coat rim of apple with caramel sauce. Mix cinnamon & sugar in shallow dish. Dip caramel covered apple in cinnamon sugar. Fill with your favorite Fall beverage.